It has been labelled by some as the “amazing comeback”. Greece has this morning sold €3 billion of five-year bonds at an interest rate of 4.95% – and the demand exceeded €20 billion. The bond auction remains small, and the yield fairly decent relative to other peripheral economies and ‘junk’ or high yield bonds of similar length. And there will always be investors looking for a better return. After all, even in the immediate aftermath of the Greek debt restructuring there were plenty of investors willing to take a punt on the newly formed bonds in the secondary market – and many of them ended up with good returns. However, there are deeper political reasons. As shown by yesterday’s anti-austerity strikes, this morning’s bombing outside the Bank of Greece and the dwindling majority of the government in parliament (which now stands at only two seats), there still is a significant amount of political uncertainty around. The government seems to harbour hopes that this return to the markets will galvanise its support, and act as a symbol of the turnaround it has helped to create. More broadly, Greece’s long term strategy for competing and growing in the eurozone remains unclear, and it has zero room to absorb further economic shocks. 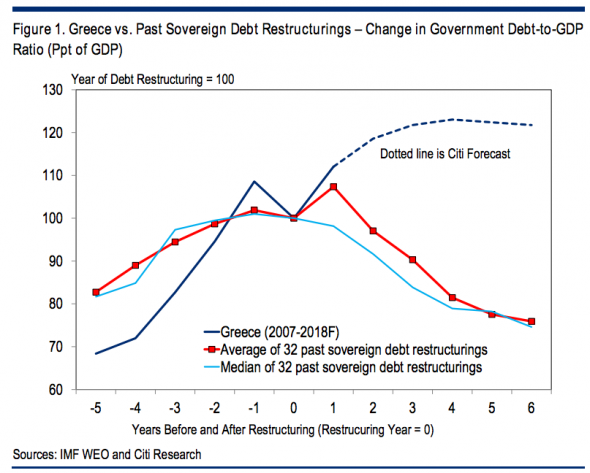 Citi – forever bearish on Greece – took it upon themselves to be the buzzkill amongst all this optimisim with the chart below (via FT Alphaville). Ultimately, it remains a small symbolic step, especially given the size of the bond issue.